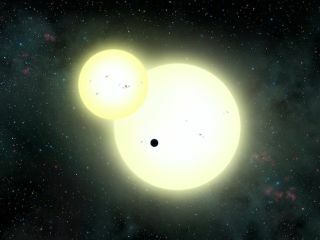 Artist's illustration of the newfound exoplanet Kepler-1647b crossing the face of one of its two host stars. A newfound alien world is the biggest ever discovered that has two suns in its sky, like Luke Skywalker's home planet of Tatooine in the "Star Wars" universe. Whereas the fictional Tatooine is a small and rocky world, however, the real-life Kepler-1647b is a gas giant about the size and mass of Jupiter. In addition to being the biggest known two-star planet, Kepler-1647b also has the widest orbit, circling its host stars in 1,107 Earth days, astronomers said. Kepler-1647b was discovered by NASA's Kepler space telescope, which launched in March 2009 on a mission to determine how common Earth-like planets are throughout the Milky Way galaxy. Kepler spots alien planets by noting the brightness dips that are caused when the worlds cross their host star's (or in this case stars') faces from the instrument's perspective. The spacecraft generally needs to observe three such "transits" to identify an exoplanet — which means that distantly orbiting worlds take longer to find. Graphic showing Kepler-1647b's size compared to that of all other two-star planets discovered by NASA's Kepler space telescope to date. "It’s a bit curious that this biggest planet took so long to confirm, since it is easier to find big planets than small ones," study co-author Jerome Orosz, an astronomer at San Diego State University (SDSU), said in a statement. "But it is because its orbital period is so long." Nearly half of all sunlike stars are part of two-star systems. Astronomers have found planets in a number of binary systems, but such worlds had previously all been Saturn-size or smaller, and had orbited relatively close to their host stars. The orbits of all previously known circumbinary planets are shown as gray circles. Kepler 1647b's much larger orbit is the red circle. Kepler-1647b is "the tip of the iceberg of a theoretically predicted population of large, long-period circumbinary planets," co-author William Welsh, also of SDSU, said in the same statement. The study team members announced their results today (June 13) at the 228th meeting of the American Astronomical Society in San Diego. Their paper has also been accepted for publication in The Astrophysical Journal. Kepler's original planet-hunting observations ended in May 2013, when the second of the spacecraft's four orientation-maintaining reaction wheels failed. But scientists are still combing through the huge amounts of data gathered by Kepler, which has discovered more than 2,200 confirmed alien planets to date. The telescope also began searching for alien worlds anew (and observing a variety of other cosmic objects and phenomena as well) in 2014, after mission team members found a way to stabilize Kepler using sunlight pressure.